Background: Health-related quality of life (HRQoL) measures have been increasingly employed in the evaluation of health utility. The aim of this study was to evaluate the impact of four different kinds of chronic diseases on the HRQoL of patients from specialist outpatient clinics in Hong Kong (HK) using the 5-level EQ-5D (EQ-5D-5L) value set. Patients and methods: Patients who attended one of the 26 Hospital Authority’s specialist outpatient clinics and met inclusion criteria were potentially sampled. The value of EQ-5D-5L (HK version) that asks the respondent to describe and rate his or her health status was used as the dependent variable. Four kinds of long-term health conditions and other demographic, socioeconomic, and health service use characteristics have been analyzed as independent variables. Chi-square test, robust one-way ANOVA, and the two-part model have been used to analyze the data. Results: A total of 7,496 (53.7%) patients reported to have at least one kind of chronic diseases. The mean score for hypertension (mean =0.882, standard error [SE] =0.207) is higher than the others, which followed by cancer, diabetes, and heart disease. Patients who were male, young, higher education attainment, and with chronic conditions got a higher EQ-5D score. In the two-part model, all the four long-standing health conditions were statistically significant in logistic model, but the magnitude of coefficients changed significantly in ordinary least squares model. Conclusion: Chronic diseases have a significant negative impact on patients’ HRQoL, but there might be a varying effect depending on what kind of chronic diseases patients had. Further research is also needed to plan appropriate strategies to improve patient-centered care. Health-related quality of life (HRQoL) measures have been increasingly employed in the evaluation of health utility.1,2 A growing number of instruments have been introduced and developed to measure the HRQoL. However, there is no consensus on which one can be recognized as a gold standard.3 In general, there are two types of health status instruments: disease specific and generic. The former focused on the symptoms and burden on the function by a specific disease or subpopulation, while the generic type mostly considered to be applicable for more general conditions or population.4 The EQ-5D instrument, developed by EuroQol, has been proved to be a reliable generic HRQoL measurement and widely used around the world.5 The 5-level EQ-5D (EQ-5D-5L) is divided into five dimensions within five levels. The Hong Kong (HK) EQ-5D-5L index tariff has been developed, based on a regional representative sample of the HK general population and described all 3,125 hypothetical health statuses explained by a local index value. The patients aged 18 years or older, who attended one of the 26 Hospital Authority’s SOPCs were potentially sampled. A territory-wide cross-sectional telephone survey was conducted in all public SOPCs in HK to collect the data. Those met the inclusion criteria were approached for a phone interview within 1 month after attending the SOPCs. Patients who could not understand or speak Cantonese, were day cases or day surveys, or attended one of the following clinics: pediatrics, hospice, psychiatry, dental, anesthesiology, pathology, nurse led, or multi-specialty outpatient clinics were excluded from the study. Before the survey, verbal consent was obtained from patients. All the participants were fully informed of the purpose, process, and their rights in the data collection. Each interview lasted for nearly 30 min. The ethical approval was acquired from the Chinese University of HK and New Territory East Cluster (CUHK-NTEC) Clinical Research Ethics Committee. The index of EuroQol EQ-5D-5L (HK Chinese version) that asked the respondent to describe and rate individual health status was used as the dependent variable. The EQ-5D-5L has five dimensions – mobility, self-care, usual activities, pain/discomfort, and anxiety/depression. There are five levels within each dimension, from “no problems” to “extreme problems,” which lead to 3,125 possible health status. Patients completed the EQ-5D questionnaire based on their health status at that moment. The HK value set of EQ-5D-5L was developed by Wong from JC School of Public Health and Primary Care (SPHPC) (unpublished), The CUHK in 2016 following new international EQ-5D-5L valuation protocol.13,14 The mean index value for the general population in HK was 0.9186. The result of visual analog rating scale (VAS) of EQ-5D was not included in our current study. All the data we used in our study were based on the HK Patient Experience and Satisfaction Survey on Specialist Outpatient Service (PESS). During the survey, patients were asked a series of questions to reflect their experience along the journey from “before the appointment” to “leave the clinic” in using specialist outpatient service. By the end of the survey, patients were asked “do you have some long-standing condition(s)?” If the answer was “yes,” they would be further asked to tick which long-standing conditions they had from a list of four types of chronic diseases (heart disease, hypertension, diabetes, cancer, and others). All of these long-term health conditions have been analyzed in our models. Both Saarni et al6 and Lubetkin et al7 indicated that demographic and socioeconomic data might affect the EQ-5D scores. Therefore, a series of demographic and socioeconomic characteristics (eg, gender, age, educational attainment, working status, living status, and received government allowance or not) were incorporated into the model to explore whether and how they could affect the HRQoL of patients with long-term conditions. We further added the factors of shared decision making in our models to evaluate their association with HRQoL. Notes: #Excluding the patients who refused to answer. ##Not involved in analysis. In total, 13,966 (62%) of 24,520 eligible patients completed the survey, of which 7,496 (53.7%) reported that they had at least one of four kinds of chronic diseases. Based on the findings of EQ-5D-5L index, 52.4% respondents reported no problems across all five dimensions. A total of 700 patients reported that they had heart disease, and 773 reported diabetes. For the condition of hypertension and cancer, the reported number was 2,500 and 174, respectively. When broken by gender, there were 386 (55.1%) males and 314 (44.9%) females suffering from heart disease, whereas for hypertension and cancer, more females reported the conditions than males (55.5% and 56.3%). Moreover, patients reported cancer condition were relatively younger than those with the other three chronic conditions. Less than 50% of respondents reported education levels as secondary or lower. For heart disease, diabetes, and hypertension, nearly 55% of patients were retired. The vast majority of patients (90%) were living with their families. The demographics of patients and their characteristics for each disease group are provided in Table 1. 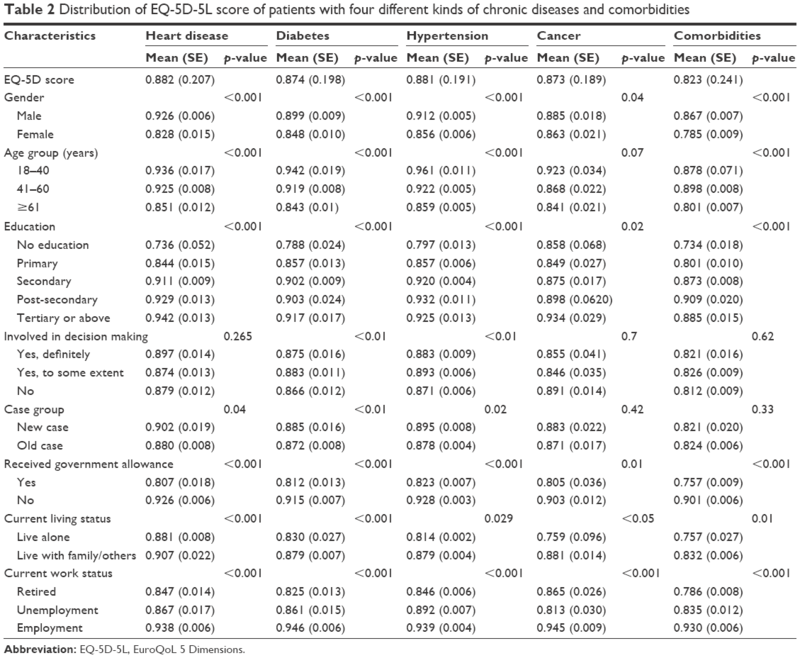 Comparison of the EQ-5D-5L scores with each disease group is provided in Table 2. The mean score for heart disease (mean =0.882, standard error [SE] =0.207) is higher than the rest, followed by hypertension (mean =0.881, SE =0.191), diabetes (mean =0.874, SE =0.198), and cancer (mean =0.873, SE =0.189). For the heart disease, hypertension, and diabetes groups, the male patients showed a higher score than the females (0.926 vs 0.828, 0.899 vs 0.848, 0.912 vs 0.856), but for cancer, which is lower (0.863 vs 0.885). The biggest gap between male and female appeared in the heart disease group, which close to 0.1. For age comparison, all the four disease groups showed the same trend, the younger the healthier. Patients aged younger than 60 years gained a score greater than 0.9 (except for the cancer group, mean =0.868, age group =41–60 years). Patients with hypertension who had the highest mean score was in the age group of 18–40 years, and patients with cancer who had the lowest mean score was in the age group of >60 years. Patients with higher educational attainment also gained a higher score. The differences in living status for all three disease groups were statically significant, except for hypertension. Patients living with family got a higher score (mean=0.907, 0.879, 0.879, and 0.881) than living alone. Those with employment (mean=0.938, 0.946, 0.939, and 0.945, p<0.001) were scored higher than retired and unemployed participants. Abbreviation: EQ-5D-5L, EuroQoL 5 Dimensions. 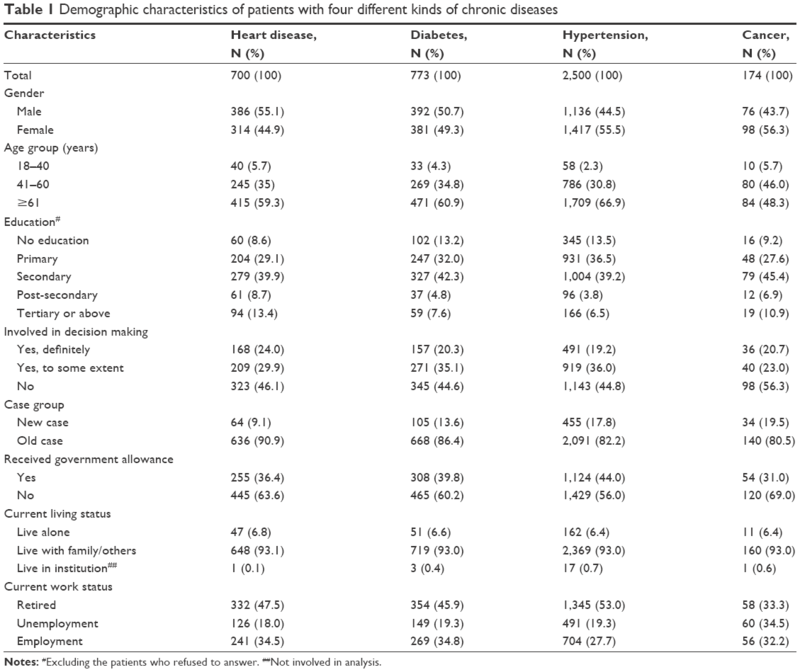 Figure 1 shows the percentage of the EQ-5D-5L score for four different kinds of chronic diseases on five different dimensions of EQ-5D-5L. Among the different EQ-5D-5L domains, the largest proportions of participants with severe problems were seen for the domain of “mobility,” with 1.7%, 1.3%, 1.1%, and 1.1% for heart disease, diabetes, hypotension, and cancer, respectively. Participants had least problems in self-care, with 85.7%, 85.9%, 87.2%, and 91% for the abovementioned four kinds of chronic diseases. On the contrary, 50.9%–54.3% of participants reported no problems in the domain of “pain/discomfort.” A relatively similar distribution of answers across all the five domains was observed. Figure 1 also shows that a higher proportion of patients rated themselves as “having no problems” across all the dimensions. Figure 1 Proportion of respondents for different levels of the EQ-5D-5L by dimension. Table 3 presents the results of the relationship between chronic diseases and socioeconomic characteristics with the EQ-5D-5L score using two-part regression model. In the first part, the logistic regression to evaluate the patients reported full health was adopted. In model 1, participants with all four kinds of chronic diseases were less likely to report full health, and all health conditions were statistically significant. Participants with cancer were less than one-third likely to report full health, followed by participants with heart disease (β=0.23), hypertension (β=0.19), and diabetes (β=0.18). In model 2, all the demographic and socioeconomic characteristics and shared decision making were considered. The likelihood of patients reporting full health decreased by age, the younger the participants, the more likely reported a full health. Compared with the participants with no education, those with higher educational attainment were more likely to report full health. Currently, living with family/others participants were more likely to report full health. Furthermore, participants who did not receive the government allowance tend to show the higher possibility to report full health. Abbreviations: EQ-5D-5L, EuroQoL 5 Dimensions; OLS, ordinary least squares; SE, standard error. In part 1 of model 2, the inclusion of socio-demographic characteristics did not have a significant impact on the predicted EQ-5D-5L scores. The magnitude of scores for these health conditions in part 1 was slightly lower compared with those in the first part of model 1. In part 2 of model 2, the magnitude of scores of all the chronic conditions was smaller than that in the first part. Participants with cancer had 0.025, lower in scores, followed by participants with heart disease (0.018 lower) and hypertension (0.015 lower) compared with those with no chronic conditions. Diabetes is not statistically significant in OLS model. The number of comorbidities is statistically significant, and respondents with no comorbidity had higher HRQoL scores than the respondents with one or more comorbidities. Regarding the pattern of the magnitude of scores with demographic and socioeconomic characteristics and shared decision making in model 2, the trend remained similar with model 1. Patients with higher educational attainment tended to have higher scores. Employed patients also tended to have a higher score than unemployed and retired patients. Patients, to some extent, who involved in clinical decision making showed higher scores than those who fully involved in clinical decision making and not involved in decision making. Our study is the first one to use EQ-5D-5L HK value set to assess the patients’ HRQoL with different kinds of chronic diseases in SOPCs in HK SAR, China. In general, our two-part model showed that all the patients with heart disease, diabetes, hypertension, and cancer had a negative impact on their quality of life. Results showed that patients with cancer reported the lowest HRQoL score, followed by diabetes, hypertension, and heart disease. In the logistic model, the results remained consistent regardless of the control of the demographic and socioeconomic characteristics and shared decision making. Hypertension was only statistically significant in the model without controlled factors. In OLS regression model, however, the results showed a little bit different, and diabetes in controlled model showed no statistical significance. Overall, the HRQoL can be affected by the socio-demographic characteristics, and consistencies among diseases exist. All the four kinds of chronic diseases in our model have indicated that patients live with families, with employment, without receiving government allowance, and have fewer number of chronic diseases tend to have a better quality of life. Some results have also been confirmed by previous studies that evaluate the association of HRQoL and chronic diseases measured by other instruments, such as 15D or 36-Item Short Form Survey (SF-36).9,18–21 However, in HK, the majority of studies only focused on the burden of one specific kind of long-term condition on HRQoL in their studies.10,22 They were not able to compare how various kinds of chronic diseases or different combinations of chronic diseases affect the HRQoL and how this influence might be possibly adjusted by their demographic, socioeconomic, and other clinical characteristics. Our study, however, preliminarily explored this relationship and provided a solid basis for further in-depth study. Previous studies in HK also reported that poor HRQoL was significantly associated with increased age.10,23 In our two-part model, the age variable was statistically significant in the logistic model, which is consistent with the findings from previous studies. However, in the OLS model, the coefficient became very small and nonsignificant. It can be concluded that no matter what age group the participants belongs to, all the chronic diseases have an equally strong impact on patients’ HRQoL. Not only do the elderly but also younger generation could possibly suffer from some chronic conditions. Management of chronic conditions, especially, for adolescence, leads to a major challenge for the individual, family, and the whole society. Educational attainment was also found to be positively related to patients’ HRQoL in both the logistic and OLS model. Both the current study and previous studies have confirmed that people with higher educational degree would report higher scores than those without a degree. Furthermore, female was found having a lower HRQoL score than male in both parts of the model, regardless of the control for other variables or not. The condition of comorbidities was only statistically significant in the OLS model, illustrating that participants with one or more comorbidities would gain lower HRQoL scores. The impact was a little bigger than any other single chronic disease. Although several other HRQoL studies have been performed using different methodologies, this is the first one adopting the two-part model to evaluate patients’ HRQoL based on EQ-5D-5L HK value set. Previous studies estimated the impact of long-term conditions on people’s HRQoL using different measures and models on a different population, which tends to make some problems if comparing the results. Our study applies the same and consistent statistical method to estimate the impact of different kinds of chronic diseases on HRQoL on the same population, using the local health status utility value set, which can diminish some bias, make results more precise, and provide sufficient evidence for assessing effectiveness and efficiency of health policies. The analysis of indicators of shared decision making is very useful and meaningful for making both good clinical and political decisions. In our study, we found that patients who reported partially involved in decision making showed better HRQoL than those reported fully involved in it, followed by no chance to involve in decision making in both the diabetes and hypertension groups. For heart disease, the fully involved group got a higher score than partially and not involved group. This pattern was discovered and analyzed in our previous study, where the association of patients’ involvement in decision making and their reported HRQoL was assessed.24 When such relationship is further explored, however, into more specific chronic disease groups, the trend is different. In recent years, strengthening the patients’ sense of presence in clinical encounters is the mainstream value in the clinical decision-making process and encouraged by a growing number of clinical leaders, professionals, and policy makers. Our study illustrated that full participation in shared decision making may not be appropriate for all patients with chronic disease, which is consistent with the conclusion by New England Journal of Medicine in 2012 that shared decision making was the pinnacle of patient-centered care, but full participation in all decision making might not be reasonable and logical.25 Patients should be respected to play their preferred role, decided by their physical, psychological, and clinical conditions. Since no previous research has ever studied the relationship between patient’s shared decision making and HRQoL with different kinds of chronic diseases in HK, we may treat these estimates as norms for the local population. This could be worthy of further exploration within the local settings to investigate more kinds of chronic diseases and the reasons for some differences and discrepancies between various conditions. The EQ-5D-5L (HK value set) is a generic HRQoL instrument, with particular benefits of reliability and being easy to use. Our study, using EQ-5D-5L, revealed that people with heart disease, diabetes, hypertension, and cancer reported worse HRQoL than those without these long-term conditions. Methodologically, we used the two-part model to analyze the data which could improve the fit and produce both unbiased and more efficient estimates of covariate effects.17 From the practical point of view, our findings illustrated how chronic disease mutually affects patients’ HRQoL, based on their demographic and socioeconomic characteristics and utility of health care services. Our study also encountered some limitations. First, it is a cross-sectional study, so a causal relationship between chronic disease and HRQoL might not be directly derived. Second, only four kinds of chronic diseases were investigated in our study, which might produce some bias, especially when less than 300 patients reported the presence of cancer. Third, when measuring the health status of HK population, the nature of EQ-5D led to a high ceiling effect, which could cause some bias and difficulties to differentiate people who report the full health condition.9,26 Finally, there is no exact definition of the four chronic diseases. What conditions should be included and what is not included in the survey still have some disagreements. It would be useful to use IC-10 codes of the International Classification in future studies. Chronic disease has a significant negative impact on patients’ HRQoL, with a varying effect depending on the quantity and quality of chronic diseases patients have currently. Recognizing the health status of HK people with chronic disease and identifying factors significantly associated with their HRQoL could serve as useful indicators for health policy makers, regulators, and researchers to make effective and efficient strategies to improve the outcome and patient-centered care in the future. Gold M, Medicine S. Brief report measure-dependent variation in burden of disease estimates implications for policy. Med Care. 2002;40(3):260–266. Cooper JK. Health outcomes. New quality measure for Medicare. Int J Qual Health Care. 2001;13(1):9–16. Guyatt G. Insights and limitations from health-related quality-of-life research. J Gen Intern Med. 1997;12(11):720–721. Hahn EA, Cella D, Chassany O, et al. Precision of health-related quality-of-life data compared with other clinical measures. Mayo Clin Proc. 2007;82(10):1244–1254. Black N. Patient reported outcome measures could help transform healthcare. BMJ. 2013;346:f167. Saarni SI, Härkänen T, Sintonen H, et al. The impact of 29 chronic conditions on health-related quality of life: a general population survey in Finland using 15D and EQ-5D. Qual Life Res. 2006;15(8):1403–1414. Lubetkin EI, Jia H, Franks P, Gold MR. Relationship among sociodemographic factors, clinical conditions, and health-related quality of life: examining the EQ-5D in the U.S. general population. Qual Life Res. 2005;14(10):2187–2196. Heins MJ, Korevaar JC, Hopman P, Donker GA, Schellevis FG, Rijken P. Health-related quality of life and health care use in cancer survivors compared with patients with chronic diseases. Cancer. 2016;122(6):962–970. Wu M, Brazier JE, Kearns B, Relton C, Smith C, Cooper CL. Examining the impact of 11 long-standing health conditions on health-related quality of life using the EQ-5D in a general population sample. Eur J Health Econ. 2015;16(2):141–151. Lam CL, Lauder IJ. The impact of chronic diseases on the health-related quality of life (HRQOL) of Chinese patients in primary care. Fam Pract. 2000;17(2):159–166. Wong EL, Yeoh EK, Slaap B, et al. Validation and valuation of the preference-based health index using Eq-5d-5l in the Hong Kong population. Value Health. 2015;18(3):A27. Xu RH, Wong ELY. Citation classics in patient engagement research: an analysis of the 50 most cited. Open J Nurs. 2017;6:630–644. Oppe M, Devlin NJ, VanHout B, Krabbe PFM, DeCharro F. A program of methodological research to arrive at the new international eq-5d-5l valuation protocol. Value Health. 2014;17(4):445–453. Oppe M, Rand-Hendriksen K, Shah K, Ramos-Goñi JM, Luo N. EuroQol protocols for time trade-off valuation of health outcomes. Pharmacoeconomics. 2016;34(10):993–1004. Wilcox R. Introduction to Robust Estimation and Hypothesis Testing. Boston: Academic Press; 2012. Starkie HJ, Briggs AH, Chambers MG, Jones P. Predicting EQ-5D values using the SGRQ. Value Health. 2011;14(2):354–360. Ramos-gon JM, Serrano-aguilar P, Rivero-arias O, Cabase JM. Valuation and modeling of EQ-5D-5L health states using a hybrid approach. Med Care. 2017;55(7):e51–e58. Ryhänen EM, Heiskanen I, Sintonen H, Valimaki M, Roine R, Schalin-Jantti C. Health-related quality of life is impaired in primary hyperparathyroidism and significantly improves after surgery. Endocr Connect. 2015;4(3):179–186. Georgopoulou S, Efraimidou S, Maclennan SJ, Ibrahim F, Cox T. Antiphospholipid (Hughes) syndrome: description of population and health-related quality of life (HRQoL) using the SF-36. Lupus. 2015;24(2):174–179. Matcham F, Scott IC, Rayner L, et al. The impact of rheumatoid arthritis on quality-of-life assessed using the SF-36: a systematic review and meta-analysis. Semin Arthritis Rheum. 2015;44(2):123–130. DeAngelis R, Ingegnoli F, DiDonato E, Gualtierotti R, Schioppo T, Salaffi F. Health-related quality of life in systemic sclerosis as measured by SF-36, EQ-5D and SF-6D: comparison with a primary Raynaud phenomenon and a selected sample of healthy controls. Ann Rheum Dis. 2015;74(suppl 2):604. Fielding R, Chan G, Lam W. Health-related quality of life assessment for Hong Kong Chinese children with cancer. Hong Kong Med J. 2011;17(6):s13–s16. Wang W, Lau Y, Chow A, Thompson DR, He HG. Health-related quality of life and social support among Chinese patients with coronary heart disease in Mainland China. Eur J Cardiovasc Nurs. 2014;13(1):48–54. Xu RH, Cheung A, Wong EL. The relationship between shared decision-making and health-related quality of life among patients in Hong Kong SAR, China. Int J Qual Health Care. 2017;6:1–7. Barry MJ, Edgman-Levitan S. Shared decision making – the pinnacle of patient-centered care. N Engl J Med. 2012;366:780–781. Brazier J, Jones N, Kind P. Testing the validity of the Euroqol and comparing it with the SF-36 health survey questionnaire. Qual Life Res. 1993;2(3):169–180.